The 20th century began on January 1, 1901 and ended on December 31, 2000, according to the Gregorian calendar. A common misunderstanding was that it started in 1900 and ended in 1999 even though popular culture reflected the correct numbering convention in such things such as the movie, 2001, which dealt with the begining of the next century. Some historians consider the era from about 1914 to 1992 to be the Short Twentieth Century. The twentieth century was a period of radical departure in the way almost every previous area of human activity. Accelerating scientific understanding, better communications, faster transportation transformed the world in those hundred years more than any time in the past. It was a century that started with steam powered ships as the most sophisticated means of transport, and ended with the space shuttle. Horses, and other pack animals, Western humanity's basic form of personal transportation for thousands of years were replaced by automobiles within the span of a few decades. The twentieth century saw a remarkable shift in the way that vast numbers of people lived, as a result of technological, medical, social, ideological, and political innovation. Arguably more technological advances occurred in any 10 year period following World War I than the sum total of new technological development in any previous century. Terms like ideology, world war, genocide, and nuclear war entered common usage and became an influence on the lives of everyday people. War reached an unprecedented scale and level of sophistication; in the Second World War (1939-1945) alone, approximately 57 million people died, mainly due to massive improvements in weaponry. The trends of mechanization of goods and services and networks of global communication, which were begun in the 19th century, continued at an ever-increasing pace in the 20th. In spite of the terror and chaos, the 20th century saw many attempts at world peace. Virtually every aspect of life in virtually every human society changed in some fundamental way or another during the twentieth century and for the first time, any individual could influence the course of history no matter their background. Arguably, the 20th century re-shaped the face of the planet in more ways than any previous century. Scientific discoveries such as relativity and quantum physics radically changed the worldview of scientists, causing them to realize that the universe was much more complex than they had previously believed, and dashing the hopes at the end of the preceding century that the last few details of knowledge were about to be filled in. For a more coherent overview of the historical events of the century, see The 20th century in review. The 20th century has sometimes been called, both within and outside the United States, the American Century, though this is a controversial term. 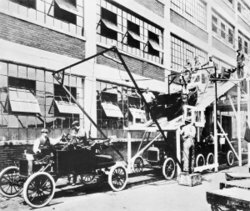 The assembly line and mass production of motor vehicles and other goods allowed manufacturers to produce more and cheaper products. This allowed the automobile to become the most important means of transportation. The invention of fixed-wing aircraft and the jet engine allowed for the world to become "smaller." Space flight increased knowledge of the rest of the universe and allowed for global real-time communications via geosynchronous satellites. Applied electronics, notably in its miniaturized form as integrated circuits, made possible the above mentioned rise of mass media, telecommunications, ubiquitous computing, and all kinds of "intelligent" appliances; as well as many advances in natural sciences such as physics, by the use of exponentially growing calculation power (see supercomputer). The development of Nitrogen fertilizer, insecticides and herbicides resulted in significantly higher agricultural yield. Chemical warfare is massively used in World War I. Advances in fundamental physics through the theory of relativity and quantum mechanics led to the development of nuclear weapons (known informally as "the Bomb" and dropped on the industrial town of Hiroshima and the historic town of Nagasaki), the nuclear reactor, the semiconductor and the laser. Quantum mechanics also led to the development of applied electronics, radiation therapy, and synthesis of many new chemicals, including antibiotics and plastics. Fusion power was studied extensively but remained an experimental technology at the end of the century. Inventions such as the washing machine and air conditioning led to an increase in both the quantity and quality of leisure time for the middle class in developed countries. 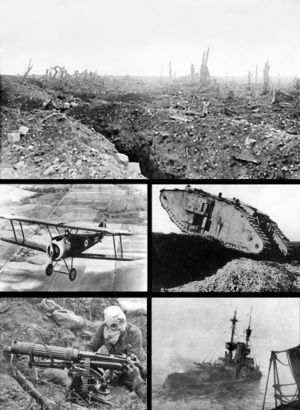 Clockwise from top: front line Trenches, a British Mark I Tank crossing a trench, the Royal Navy battleship HMS Irresistible sinking after striking a mine at the battle of the Dardanelles, a Vickers machine gun crew with gas masks and a Sopwith Camel biplane. After decades of fight of the Women's suffrage movement, the right to vote for women is introduced in all western countries. In the Spanish-American War Spain loses its last colonies. The USA occupy Cuba, Puerto Rico and the Philippines and wins the Philippine-American War against the independence movement. Rising nationalism and increasing national awareness were among the causes of World War I, the first of two wars to involve all the major world powers including Germany, France, Italy, Japan, the United States and the Commonwealth of Nations. World War I led to the creation of many new countries, especially in Eastern Europe. Ironically, it was said by many to be the 'War to end all Wars'. The economic and political aftermath of World War I and the Great Depression led to the rise of Fascism and Nazism in Europe, and shortly to World War II. This war also involved Asia and the Pacific, in the form of Japanese aggression against China and the United States. Among soldiers, civilians also suffered greatly in World War II -- from the bombing of cities on both sides, and in the German genocide of the Jews and others, known as the Holocaust. In 1945 the Atomic bombings of Hiroshima and Nagasaki take place. A violent war broke up in Spain in 1936 when General Francisco Franco rebelled against the Second Spanish Republic. Almost 1,000,000 people died. Many consider this war as a testing battleground for WWII as the Nazi armies bombed some Spanish territories. During World War I, in Russia the Bolshevik putsch took over the Russian Revolution of 1917, precipitating the rise of communism. After the Soviet Union's involvement in World War II, Communism became a major force in global politics, spreading all over the world: notably, to Eastern Europe, China, Indochina and Cuba. This led to the Cold War and proxy wars with the West, including wars in Korea ( 1950- 1953) and Vietnam ( 1957- 1975). The civil rights movement in the USA and the movement against Apartheid in South Africa challenge successfully segregationist practices. The "fall of Communism" in the late 1980s freed Eastern and Central Europe from Soviet supremacy. It also led to the dissolution of the Soviet Union and Yugoslavia into successor states, many rife with ethnic nationalism, and left the United States as the world's superpower. Through the League of Nations and, after World War II, the United Nations, international cooperation increased. Other efforts included the formation of the European Union, leading to a common currency in much of Western Europe, the euro around the turn of the millennium. The end of colonialism led to the independence of many African and Asian countries. During the Cold War, many of these aligned with the USA, the USSR, or China for defense. The creation of Israel, a Jewish state in a mostly Arab region of the world, fueled many conflicts in the region, which were also influenced by the vast oil fields in many of the Arab countries. As the century begins, Paris is the artistic capital of the world, where both French and foreign writers, composers and visual artists gather. By the end of the century, the focal point of global culture had moved to the United States, especially New York City and Los Angeles. 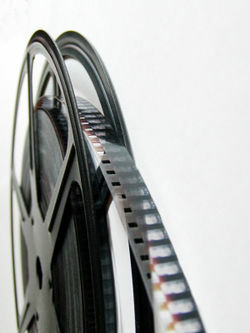 Movies, music and the media had a major influence on fashion and trends in all aspects of life. As many movies and music originate from the United States, American culture spread rapidly over the world. After gaining political rights in the United States and much of Europe in the first part of the century, and with the advent of new birth control techniques women became more independent throughout the century. Rock and Roll and Jazz styles of music are developed in the United States, and quickly become the dominant forms of popular music in America, and later, the world. Modern art developed new styles such as expressionism, cubism, and surrealism. The automobile provided vastly increased transportation capabilities for the average member of Western societies in the early to mid-century, spreading even further later on. City design throughout most of the West became focused on transport via car. The car became a leading symbol of modern society, with styles of car suited to and symbolic of particular lifestyles. Sports became an important part of society, becoming an activity not only for the privileged. Watching sports, later also on television, became a popular activity. X-rays became powerful diagnostic tool for wide spectrum of diseases, from bone fractures to cancer. In 1960-s, Computerized tomography had been invented. Another important diagnostic tool is sonography. Development of vitamins virtually eliminated scurvy and other vitamin-deficiency diseases. New psychiatric drugs were developed. This includes antipsychotics which are efficient in treating hallucinations and delusions, and antidepressants for treating depression. However, some of these drugs have serious side effects, and they usually cannot heal a psychiatric disease, only treat it. Role of tobacco smoking in developing cancer and other diseases had been proved in 1950-s (see British Doctors Study). New methods for cancer treatment, namely chemotherapy, radiation therapy, and immunotherapy, were developed. As a result, in many cases cancer can be completely healed. New methods for heart surgery were developed. Cocaine and heroin were found to be dangerous addictive drugs, and their wide usage had been outlawed. Contraceptive drugs were developed, which reduced overpopulation. AIDS killed millions of people. AIDS treatments remain inaccessible to people living with HIV/AIDS in developing countries, but even with the best available treatment, most patients eventually die from AIDS. Due to increased life span, the prevalence of old age diseases, including Alzheimer's disease and Parkinson's disease increased.